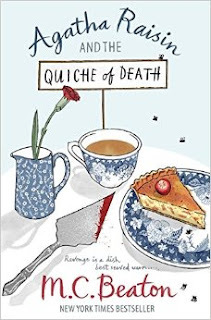 I had a lot of high hopes going into Agatha Raisin and the Quiche of Death. Firstly, that title. It couldn't be more ridiculously British, could it? Secondly, a blog that I used to follow raved about this series. Thirdly, after the utter disappointment of De Sade's Valet, I was really hoping for something good to make up for it. Our protagonist, the eponymous Agatha Raisin, is a middle-aged public relations guru who decides that it is time for her to take an early retirement and settle down in her dream cottage in the Cotswolds. Finding that her entrance to the village hasn't made as big of a splash as she would have hoped, she decides that the easiest way to make an impression would be to win the local quiche-making competition. Not being the baking type, she enters a quiche that she brought at a London deli. Unfortunately, the competition judge is found dead from poison after eating said quiche, giving her an instant reputation as both a cheat and a possible poisoner. She takes matters into her own hands in order to salvage what is left of her pride. The Quiche of Death was exactly what I needed after my last disappointing read. I make no secret of the fact that I am enormously fond of cosy mysteries, and this first entry to the Agatha Raisin series ticks pretty much all of the boxes for qualities that I look for in that genre. First, there is an engaging main character/detective. Part of me feels that I may like Agatha because she embodies what I imagine that I will be like in my middle age: childless, lacking in both patience and social skills, and more than a little snobby, but with good intentions nonetheless. It is quite refreshing to have a protagonist who manages to rub everyone up the wrong way almost by accident. While her detective work wasn't as focused as I'm used to, it managed to blend into her general attempts to fit into village life rather well and didn't seem so out of place. Second, the setting is pretty much perfectly depicted. In describing Carsely, Beaton manages to tread the fine line between twee and unnerving that is essential when depicting English villages. On the one hand, it is pretty and twee enough that it feels understandable why Agatha would settle there, being quiet and very traditional, contrasting nicely with her old life in London. On the other hand, it has to have that weirdly insular and unnerving feeling that I can only describe as "localness", the knowledge that you will pretty much be forever an outsider and the shockingly short amount of time that it takes for gossip to spread. There's a great line where Agatha's awful neighbour is being discussed, and within the same statement she's described both as an incomer and having lived in the village for over 20 years. It's that duality that makes Carsely seem believable. I would say that the actual mystery part was a bit weaker, but not enough that it started affecting the quality of the novel itself. I suppose my main issue with it was that there didn't really seem to be much in the way of suspects or the kinds of big reveals. While it fit with the slower, more tentative pace set by Agatha learning her way around a new home, I don't think the mystery itself could have stood up as well by itself. I wouldn't say that it's a particularly big issue though.